Very good condition - Minimal wear. 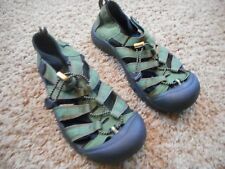 KEEN Women's Size 6 Sandals, Brown, Waterproof EUC. Perfect for SUMMER!! 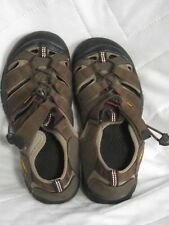 KEEN Women's Size 6 Sandals, Brown, Waterproof EUC. These shoes are in great condition, minor signs of wear. Don't miss this deal! Black Soles. I’m happy to provide you with any other photos or information, just ask. Pre-owned, worn twice. One of the original teva sandals. Ty for considering. Easy slip-on slide with adjustable hook-and-loop closures. Smooth and breathable leather linings. Leather-wrapped, contoured and cushioned EVA footbed for all-day comfort. Lightweight and flexible rubberized outsole for added traction. Imported. 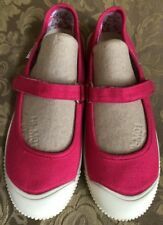 KEEN Girl's WATERPROOF Water Shoes Closed Toe Size 6 - 1006567 Pink sandals . Condition is Pre-owned. Shipped with USPS Priority Mail. Up to your considaration a pair of Keen sport flats, ideal for the summer day In like new condition, store display model, a shoe that’s been tried in store Canvas upper balance man made materials Size women 6 EU 37 22.5 there is a mistake with the label size, reads US 4 but it is a US 6 Pink upper, bone white soles in color Anti odor anatomic footbed 100% Vulcanized rubber I buy and sale as is, what you see is what you’ll get, feel free to ask any questions I ship same day business if paid before noon eastern time Monday to Saturday Please check my other listings for more great items Thank you! McCaw Parrot Print. This is a Jeffrey Campbell Espadrille. Velcro Slingback Strap. Canvas uppers, leather lined. Pink With Bright Silkscreened Bird. New without Box. CONDITION: GREAT! Minor scuffs on the toes and back strap. See pictures! Waterproof Sandals. Velcro at the ankle with a elastic toggle strap. Camo Green color. Non-marking soles. In very good pre-owned condition. Gently pre-worn condition with light wear on the soles. We will typically respond within a few hours. 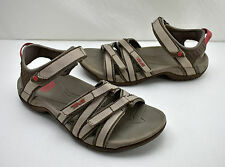 Teva Tirra #4266 sandals are in excellent condition, gently worn. Clean contoured EVA footbed with good arch support. Cushioned Shoc Pad heel; Spider original outsole is durable with great traction and shows light wear. Shoes show sign of little regular use. Overall in good pre-owned condition. Keen H2 Newport. Waterproof Sandals/Hiking Shoes. Mistakes do occasionally happen. You must be 100% satisfied. I aim at providing quality service to you. Preowned in excellent condition with minor wear on the bottoms of the shoes. J Sport by Jambu Womens 6 Turquoise Lightweight Open Toe Water Sport Sandals. Condition is Pre-owned. Shipped with USPS Priority Mail. COACH ADDISON GRAFITTI MULTI COLOR WITH PINK HEARTS. WEDGE SANDLE WITH VELCRP STRAP. Double your traffic. We will do our best to help you!